Celebrate Dagny graduating from the Isolette and passing her Car Seat Challenge by going out to get ice cream at Hub City Ice Cream Company. A Wisconsinite who will eat an ice cream cone outside in 45-degree drizzly weather because she’s been inside of a hospital for six days. We walked over to the NICU from Ronald McDonald House-Marshfield early in the morning so that we could catch rounds with Dagny’s doctor. It was at this set of rounds (and to Dagny’s rockstar nurse of the day, Heather) that we made some major steps forward to breaking our girl out of the NICU: she would be taken out of the Isolette and placed into a regular crib and she would be put to the test in her Car Seat Challenge. Because Dagny had been acing all of her tests for the last nine weeks she was still in utero, I had no doubt she would crush these tests today. By the time we made it back to her bedside after eating breakfast in the hospital cafeteria, her Isolette had been wheeled away, a crib in it’s place, and we found Dagny 60-minutes into her Car Seat Challenge: she needed to be able to safely sit in her car seat for 90-minutes and meet the car seat’s minimum weight of four-pounds. 30-minutes later, she checked her Car Seat Challenge off of her to do list. We spent much of the rest of the day at her bedside, helping with feedings every three hours and then reading (hubby), writing (me), meeting with nurse Anna about nursing Dagny (me again), and staring at her in her crib (both of us). We, independently, went out to dinner with our families so that one of us was always there to feed Dagny and by about 6:30pm we decided it was time for the both of us to take a break and find something in Marshfield to do. Since we had both already eaten, and it was a Sunday in a small town, I figured our options were limited, but I decided that I wanted ice cream and would go to any fast food restaurant to get some if I had to. Going out for ice cream always brings a feeling of nostalgia for carefree childhood living and, after spending several days in the NICU, I needed a feeling of relief and normalcy. I was shocked to find that Marshfield’s Hub City Ice Cream Company was open! We drove the few miles down the main street of Marshfield, commenting on how cute the small town’s “downtown” area was and found hub City, across the street from Dairy Queen, Wildwood Park, and Hefko Pool, with a full parking lot. 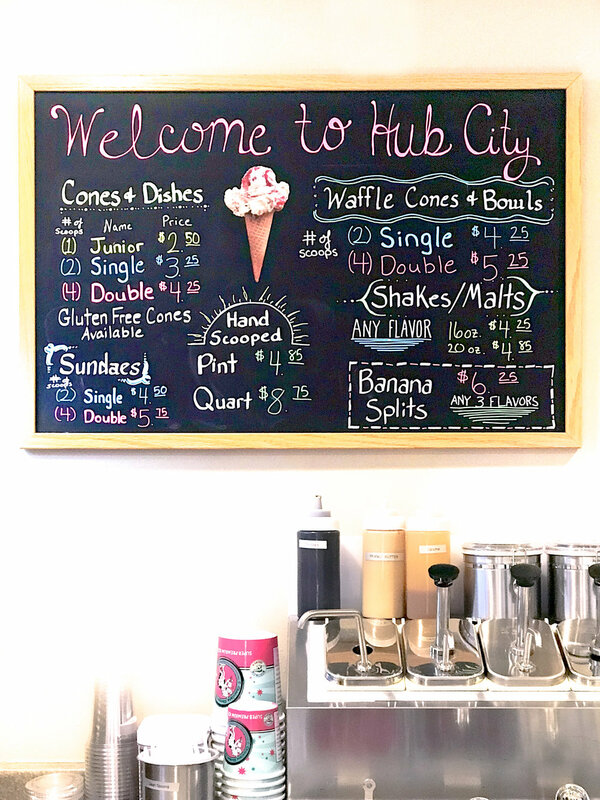 HUb City Ice Cream opened in 2013 to serve Wisconsin’s own Chocolate Shoppe Ice Cream to Marshfield’s residents (and the many visitors the hospital brings into town). Owners, Sandy and David Freeman, have lived in Marshfield for over 30-years. They had an abundance of traditional and unique flavors: I chose lemon poppyseed, which was heavenly. Hub City has both indoor and outdoor seating. As we drove up, the twinkle lights on the outdoor patio caught my eye. After ordering our treats, we decided we were going to soak up some fresh air and sit outside even though it was 45-degrees and drizzling. we’re tough Wisconsinites after all. For the last several days, I felt guilty anytime I was away from Dagny’s side, but I had to be honest with myself in saying that It felt nice to take a minute for ourselves again. The last ten weeks have been a rollercoaster of emotion and while we had been able to continue on with our daily lives and routines, for the most part, the fact that she had safely arrived on Earth and was getting closer to being able to come home with us felt like we were finally on the home stretch. We just needed to make it a couple more days. So, Thank you to the Hub City Ice Cream staff, who, unknowingly made these newborn parents feel less like hospital zombies and more like regular people again. We finally realized that in order to best take care of Dagny, we needed to take care of ourselves too.